The Montessori classroom is a home away from home, a happy place full of friends where you can be yourself. It is a place full of interesting things to do, but also a place where you can take time out and just be quiet if you want to. It is somewhere where you can grow up knowing that you belong and that you are special. The layout of the classroom encourages exploration, communication and the development of relationships on all levels. Everything reflects a dedication to quality, beauty and to the children’s abilities to do things for themselves. The child relies completely on the environment for the sensorial impressions through which he gains a sense of the world in which he lives. A great deal of attention is paid to the way in which Montessori classrooms are laid out. It is a happy, friendly place where children feel at home, where they know where everything is and where they don’t always have to rely on adults to help them. 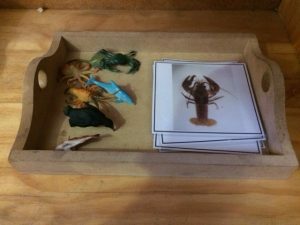 Everything in a Montessori classroom is made to be easily accessible to the children. The children must feel that the classroom belongs to them rather than the teacher. Montessori saw that young children are frequently frustrated in their attempts to do things for themselves and that what they need is to have specific exercises, as closely linked to real life as possible. It allows them to master the tasks that they see going on around them in everyday life. She observed that unlike adults in their lives, the children are not interested in achieving end results as quickly as possible, but are far more interested in the learning process. As a result they will happily repeat exercises again and again until they feel satisfied. Practical Life activities are therefore an important part of the Montessori environment. The child is attracted to activities that he sees going on around him and that give him independence and control of his own life. She therefore introduced into her classrooms, materials and exercises that allow children the maximum opportunity to learn how to both look after themselves and their environment. 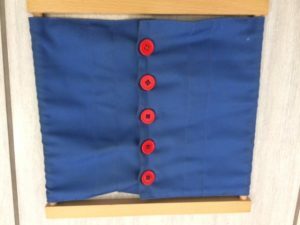 In the Practical Life area you will see special frames to help children learn to do up and undo clothes, lots of spooning and pouring exercises, stirring, whisking grating, cutting and threading activities and many other activities that children see going on around them at home. 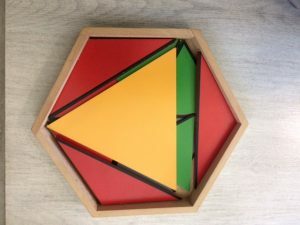 The need for order, exactness, self-correction and quiet reflection are all qualities that Montessori saw are needed in order for children to develop as they should. By isolating specific qualities in the materials and by grading each set of ever refined series, she was able to give the children the ability to increasingly refine each of their senses. 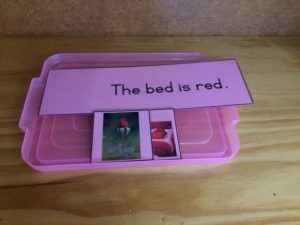 Many of the exercises in this area are an indirect preparation for later mathematics and language work as they enable the child to order, classify and describe sensory impressions in relation to length, width, temperature, mass and colour. Montessori was a great believer in indirect preparation. 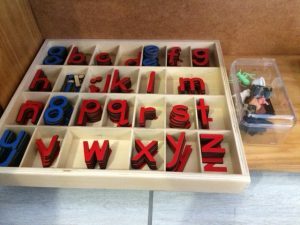 She created sets of metal insets that children use for drawing but that actually help form the fine motor skills for subsequent writing. Many of the Practical Life and Sensorial exercises are designed with this in mind. When the child is ready, we begin to teach the phonetic sounds. Then the shapes of letters made from sandpaper. We then move onto word building and recognition with the movable alphabet and then book reading. The child’s writing commences as part of his natural desire to express his new knowledge and nearly always precedes reading. The mathematical concept is presented firstly in concrete form followed by the abstract written version. The materials for mathematics introduce the concept of quantity and the symbols. Then using a variety of beads and symbol cards, the child becomes familiar with the numbers as a decimal system by means including concrete experiences with the operations of addition, subtraction, multiplication and division. These operations not only teach the child to calculate, but they provide a deep understanding of how numbers function. Montessori saw that the children were full of curiosity and loved exploring new things for themselves. She also saw that they wanted to explore things in increasingly complex ways. She developed a wide range of beautiful materials that allowed the children to gain an appreciation of biology, geography, simple science and history. 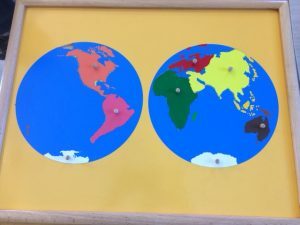 Each of these areas allows the children to explore and experiment with concepts such as metamorphosis, life cycles, land formation, the planets and time lines. 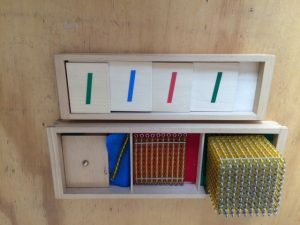 The Montessori environment is full of opportunities to experiment with different and exciting materials. Whether involved in painting, singing, playing instruments or dancing, children are encouraged to be individuals. They are free to express their feelings and emotions and free to enjoy the rich world of movement, sound, colour and sensation. Montessori schools offer the children activities that are based upon real activities in the real world. Montessori felt that young children need experiences rooted in the real world. She believed on building their imagination from reality. She was not against fantasy but from observation of the child below the age of six she came to realize that they preferred to be grounded in the real world first. A Montessori environment is one where adults and children care for one another and are not afraid to show it. It is somewhere where the children can learn as much as possible about the things that interest them. It is a place where the child can be himself and can learn to really love learning and imparting his knowledge to his fellow peers.